We will make every effort to see emergencies on the same day. 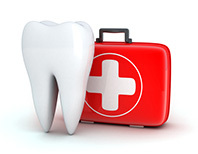 Dental emergencies for patients range from a missing front denture tooth to severe infection. If you have suffered any kind of dental injury, whether traumatic, cosmetic or due to decay, our experienced dental staff is here to help. We will strive to make your visit as comfortable as possible no matter your emergency. Don’t hesitate, call us to learn about your options and schedule your visit at (715) 723-0287. Financing Available. Any kind of tooth damage — broken dentures, lost crowns or fillings, or a broken tooth — should be taken care of immediately. The danger of putting off care could result in the problem becoming much worse, sometimes requiring hospitalization and higher cost.